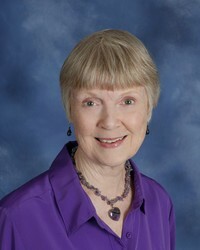 Barbara has rung handbells and directed handbell choirs for 25 years. A member of Handbell Musicians of America, formerly the American Guild of English Handbell Ringers, she studied handbells with Dr. Paul Rosene at ISU and Donald Allured, and received her B. Mus. Ed. from Wheaton college and M. Elem. Ed. and Music from the University of Illinois. A retired public school teacher, she was a church organist and choir director for many years.